Please ensure that you arrive 30 minutes prior to departure time. If you have not checked in 10 minutes prior to the departure time, you risk missing the sail. 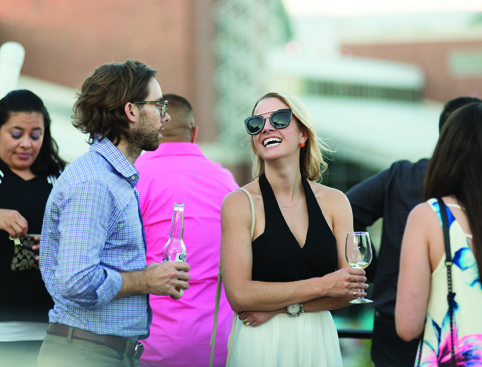 Premium free bar including house wines, domestic and imported beers & soft drinks. 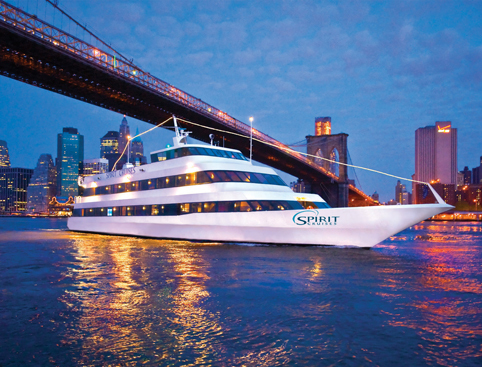 The Spirit of New York Dinner Cruise is the ultimate in New York sophistication! Experience the city from the water while enjoying an excellent meal on this elegant yacht. See the famous Manhattan skyline from a totally different side as you glide past some of New York’s biggest sights. Enjoy a delicious all-you-can-eat buffet freshly prepared on-board as you cruise alongside some of the world’s most renowned views. With first-class entertainment, impeccable service and superb cuisine, this is guaranteed to be one of the most relaxed sightseeing experiences you have in New York! Guaranteed Window Seating is available upon request and costs an extra £20pp for Sunday to Friday Cruises and an extra £25pp on Saturday Cruises. Please call us on 0344 873 0070 if you wish to book a window seat. Choose the VIP upgrade for superb personal service throughout, amuse bouche (palate teaser) and premium open bar with alcoholic drinks inclusive such as mixers, house wines, domestic and imported beers as well as soft drinks. Boarding starts at around 6:30pm with a 7pm departure and a 10pm return. From 1st January 2018 the Sunday Dinner Cruise will board from 5:30pm and the Cruise will depart at 6pm. Please ensure you that you arrive at least 30 minutes prior to departure, so that you have enough time spare to find your way to the ticket booth at the relevant pier and join the queue for boarding. Please note that cruise times are always subject to change and we will confirm the details to you once you have made your booking. Please allow approximately 3 hours for your cruise. 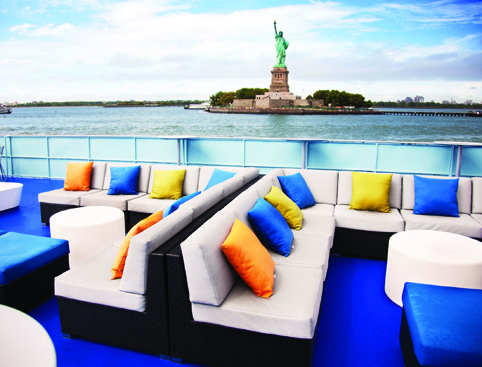 This Cruise departs from Pier 61, Chelsea Piers and 23rd Street in Manhattan. We recommend Jackets for men and cocktail dress for women. No jeans, shorts, tank tops, halter-tops, gym shoes or flip-flops are permitted on this cruise. You must be 21 years or older with valid photo ID in order to board this cruise. 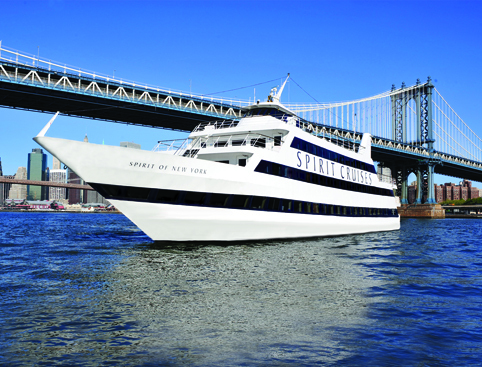 Spirit Dinner Cruises - New York is rated 5.0 out of 5 by 1. Rated 5 out of 5 by LisaMarie from Best experience in New York! This was one of my favourite experiences in New York! 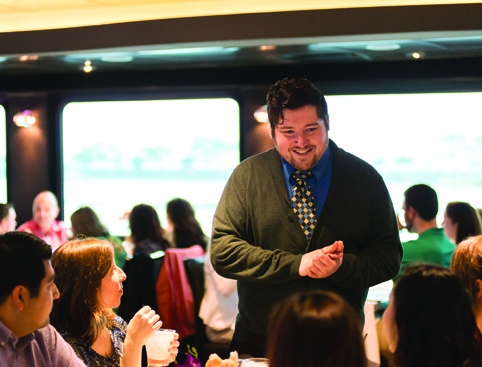 On the dinner cruise I enjoyed a sit-down meal of my choice, at the bountiful buffet with plenty of mouthwatering food options! I had the VIP package with all-inclusive wines, beers and soft drinks, so there was no worrying about spending dollars! The cruise sails in the evening so I had a fabulous view of Manhattan, Brooklyn and even the Statue of Liberty as they light up for the night. The was a lot of entertainment, music and dancing on board. I went out to the outdoor deck to take in the breathtaking views of the city, and was perfect for pictures! A truly unforgettable experience.